Attitude towards risk can be an important factor in explaining various economic decisions, such as the choice of self-employment. 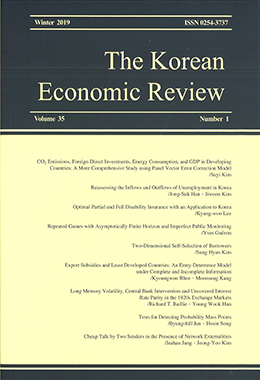 As a first step towards understanding the prevalence of self-employment in South Korea, we structurally estimate risk aversion parameters based on the standard expected utility theory. We use hypothetical lottery questions from a large-scale longitudinal survey (the Korean Labor and Income Panel Study) conducted in two waves to a sample of approximately 8,000 individuals. The estimation results show that the constant relative risk aversion parameter ranges from 0.6 to 0.8: male, younger, less educated, unmarried and higher income individuals are less risk averse. Erroneous responses are more likely for male, younger, more educated and poorer respondents. We also find significant impact of responses to the hypothetical questions on self-employment, which suggests that our estimates for risk preferences are likely predictive of actual choice of self-employment.